Twiggs Money Flow signals accumulation if above zero, while negative values signal distribution. The higher the reading (above or below zero), the stronger the signal. * Go long if a breakout above resistance is supported by Twiggs Money Flow above zero. 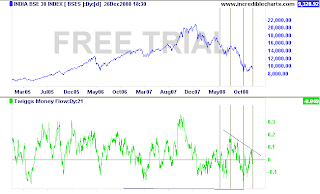 * Go short if a breakout below support is confirmed by negative Twiggs Money Flow. * Go long on a bullish divergence. * Go short on a bearish divergence. * Twiggs Money Flow trends downwards and completes a peak without crossing above zero. In other words: when Twiggs Money Flow respects the zero line.